This video is a collection of Monet's paintings with captions of the title and date of the piece. Its a long video (11 minutes) take a moment to watch and get a better idea of the type of images that he painted. Notice how many paintings include water. He enjoyed showing how light and reflections change the 'color' of the water. Claude Monet was born in Paris, France on November 14, 1840. He was the second child of Louise-Justine Aubry and Claude Adolphe Monet. In 1845, the Monet family settled near the ocean in Ingouville, France. In 1851, Claude began attending school. He studied many subjects including art. When he was a young teenager it became apparent he had artistic ability. Claude would draw caricatures of his teachers on his schoolwork. By the time he was 15 he had developed a reputation as a caricature artist, and his caricatures were displayed in the window of a local frame maker's shop where people began to recognize their fellow villagers in the drawings. Claude soon began to charge people to draw their caricatures and was able to make a steady income. Claude's mother died on January 28, 1857. The Monet family soon moved to Le Havre, France. A year later the young artist met landscape painter Eugene-Louis Boudin, a mentor who first introduced Claude to Plein Air (outdoor) painting. Claude was reluctant at first to leave the studio and the familiarity of indoor scenes. Eventually he joined Eugene, spending many hours painting directly from nature. The ocean particularly inspired Claude. He liked the way the light reflected off objects and the water. In 1860 Monet was drafted into the military and sent to Algeria. During these years of service Monet did not paint at all. Upon his return to Paris he picked up where he left off and began painting again. Monet also met Camille Doncieux in Paris, and then married her in 1870. Camille modeled for many of his paintings. He became a father to a son with Camille. Monet became known as an "Impressionist" - a title derived from his painting, "Impression, Sunrise ". The work has an unfinished look, which was very different from the paintings of artists who lived before him. The brush strokes were lively and spontaneous, capturing the feeling of the moment. He said, "Landscape is nothing but an impression, and an instantaneous one, hence this label that was given us, by the way because of me." In his later works Monet continued to capture the affect of light. Sometimes he wouldpaint the same object over and over again, but at different times of day or year. Examples of these works include his haystacks, morning views of the Seine, the Gare Saint-Lazare, Poplars, the Thames, Rouen Cathedral, and his celebrated series of waterlilies. 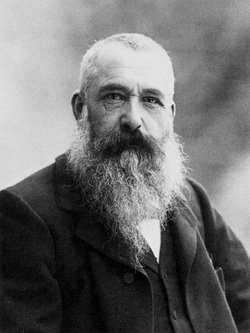 Claude Monet died in Giverny, France on December 5, 1926. It took many years for people to appreciate his work. Today, the art of Monet is an inspiration to many artists around the world.